Yen weakened on risk appetite amid easing trade war concerns, wages' growth not affecting inflation. US Treasury yields remained around Wednesday's closing levels, USD/JPY ignored them. 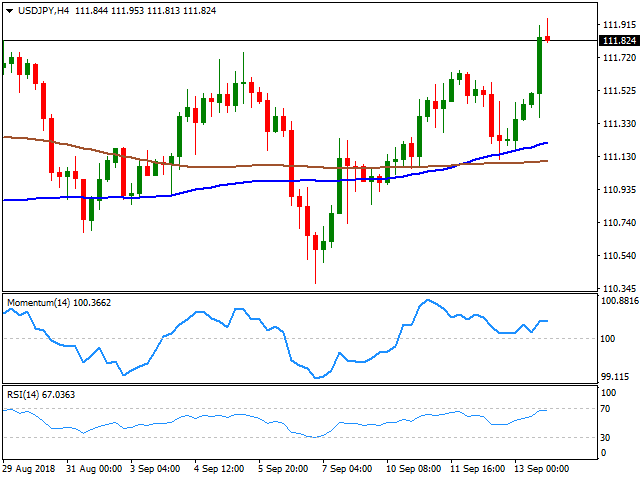 The USD/JPY pair surged to 111.95 its highest in over a month, rallying alongside with equities and despite broad dollar's weakness on soft US inflation. Risk appetite was, in fact, boosted by the softer-than-expected US CPI as inflation eased but held above the Fed's target, a couple of days after the country reported strong wages' growth in the same month, and that's good news, as there are no signs that higher wages are generating inflation, therefore the Fed won't have to make sudden changes to its monetary policy. The positive sentiment was also supported by decreasing trade war concerns. US Treasury yields eased just modestly, with the yield on the benchmark 10-year Treasury note unchanged daily basis at 2.95%. Japan will release July Capacity Utilization and Industrial Production. Meanwhile, the pair trades near the mentioned high, consolidating gains. In the 4 hours chart, it recovered sharply from around the 100 and 200 SMA, which tested late Wednesday, while the Momentum indicator stabilized above its 100 level and the RSI holds near overbought readings, both reflecting the current quietness rather than suggesting upward exhaustion. A key resistance is now 112.14, August monthly high, with selling interest most likely easing further on a break above it.